It's well-known that New Yorkers are crazy for fashion. NYPD officers witnessed the chaos first hand as officers responded to calls for crowd control at Adidas' Fifth Avenue location Saturday morning. 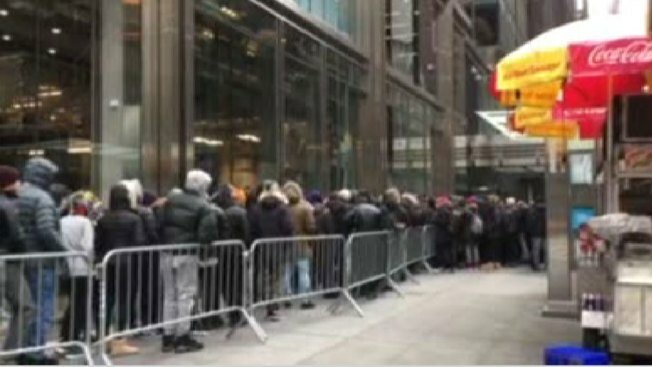 A line of eager sneakerheads snaked along 46th Street from Fifth Avenue toward Madison Avenue on Saturday morning for their chance to purchase the highly coveted Adidas "OG" NMD, a sneaker that the athletic wear brand originally released in December 2015 to much fanfare. Brands frequently rerelease popular colorways of classic sneakers, notably Jordan Brand, whose Air Jordan retros typically sell like hotcakes within an hour or two after they drop. In Adidas case, the shoe was so hot that cops had to shut down the store by 11 a.m.
Online shoppers sat at their computer at the crack of dawn, some up at 7 a.m., trying their luck at coveting the 2017's hottest release so far. A couple of fanatics were sucessful at getting through checkout, though the website allegedly crashed and froze several times in the process. One wife with "lucky hands" purchased a pair for her husband, who was ecstatic. Other sneakerheads weren't so lucky and took to social media to express their frustrations about the missed opportunity. Just had the NMD_R1 PK OG ‘Black's in my cart at the final process to check out, but @adidas website decided to crash on me instead. FML! Even those who aren't sneaker aficionados wanted in on the NMD madness. If you tried to get your hands on a pair but weren't able to, don't fret, as several resellers posted links on social media within hours after the release ended. Looking good will cost a pretty penny — one Facebook user says the sneakers resold as high as $1,000, but have now dropped within the $400 to $600 range. That's at least 3.5 times the original price point of $170. A pair of original release OG NMD's allegedly sold for $1,200 before the announcement of a rerelease last September. Your wallet might be hurting, but beauty is pain, right?